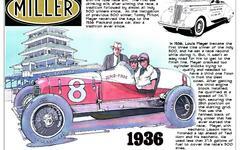 This package contains two lengthy articles on the first Indianapolis 500. Both published in the Indianapolis Star on May 31, 1911, it just flat-out doesn't get any better than this. No book, no magazine, no retrospective beats this. The Star has everyone else covered. If you think you're an expert on the first Indianapolis 500, you better have read these articles. Note that despite my high praise, there is at least one glaring error in one of the articles. The reporter credits National driver Howdy Wilcox with leading the first lap, but it was actually Johnny Aitken - his teammate in the dark Navy-blue National that took that historic honor.